In a strange coincidence, shortly before I started reading Science Fiction Double Feature: The Science Fiction Film as a Cult Text, I was involved in an online discussion about the nature of cult films. I argued that no filmmaker would deliberately set his or her mind on making a cult film, because this means that by definition the film would be seen only by a small (if devoted) group of fans, and filmmakers would want their films to be seen by as many people as possible. Another user disagreed, claiming that there are enough examples of box-office hits that gained cult following. This is an interesting explanation, yet it does not really solve the riddle of what separates a cult film from one aimed at the "mainstream audience," especially when it concerns the science fiction genre; in particular, the second manner of "privileging" the audience by distancing them from the text seems a curious one—couldn't it be said to apply to practically all works of cinematic science fiction, including mega-blockbusters like Avatar (2009)? Or perhaps, when such a film is watched by "cultists" as Telotte defines them, they experience it differently than "non-cultists"? To answer such a question would probably require an anthropological study of the audience itself, while Telotte and Duchovnay's book limits itself to textual analysis. Despite that, and the fact that almost all the articles collected in the book are excellently written, it does lose something by largely failing to comment on the boundaries between "cult" and "mainstream" science fiction film. The closest the book gets to such commentary, in fact, is in its first article, "From 'Multiverse' to 'Abramsverse': Blade Runner, Star Trek, Multiplicity and the Authorizing of Cult/SF Worlds" by Matt Hills. Hills demonstrates how two mainstream films—Ridley Scott's Blade Runner (1982) and J.J. Abrams's Star Trek (2009)—became the object of enthusiastic fan analysis focused on drawing out as many details as possible about the futuristic world in each. Hills differentiates between the almost-accidental circumstances that turned Blade Runner into a cult film (the many errors and inconsistencies in the film that open the door for interpretations) and the calculated manner in which Star Trek attempted to be one (corresponding with the larger universe established in the Star Trek franchise, while at the same time rocking its foundations). Close behind is Sharlyn Orbaugh's article "The Cult Film as Affective Technology: Anime and Oshii Mamoru's Innocence," which offers a surprisingly broad analysis about the connection between science fiction, technology, anime, and the cult film audience. While the analysis is thoughtful, and the case study analyzed—Innocence (2004), Mamoru Oshii's sequel to his better-known film Ghost in the Shell (1995)—does demonstrate Orbaugh's arguments well, I'm nevertheless a bit puzzled as to its selection; it is a film that never left a major impression among the anime, cult-film, or science fiction fan audience, certainly not in comparison to its predecessors. The opening section of the book, in which both these articles appear, is entitled "The Multiple Texts of the SF/Cult Film" and is devoted mostly to content; its other articles offer interesting case study analysis, but for the most part strangely avoid drawing bigger conclusions. Gerald Duchovnay's essay about Sean Connery's transition from his defining role as James Bond to a star of cult science fiction film is thoughtful, for example, but it deals exclusively with his performance in Zardoz (1974), with no mention of Outland (1981) or, even more significantly for the discussion of cult films, Highlander (1986). Similarly, Stacy Abbott's analysis of how filmmakers such as David Cronenberg and Larry Cohen infused the cinematic science fiction film with splatter (violent gore) is fascinating—but it does not touch upon how the "splatter" element found its way from the domain of independent films to the more mainstream cinema (or, for that matter, how Cronenberg himself made a very similar transition). I suspect that the researchers' lack of acknowledgement of the relationship between cult and mainstream cinema is more of a problem for me than it will be for other readers, but I felt that there was a missed opportunity here to demonstrate the true influence that cult films have on mainstream science fiction cinema and mainstream cinema in general. The second section of the book, titled "SF Media and the Audience," deals with the relationship between science fiction cult films and their audience, and it contains the two most significant articles in the volume—Rhonda Wilcox's "Whedon, Browncoats and the Big Damn Narrative: The Unified Meta-Myth of Firefly and Serenity" and Chuck Tryon's "Iron Sky's War Bonds: Cult SF Cinema and Crowdfunding." Wilcox's article follows the process in which fans of Joss Whedon's short-lived show Firefly (2002) played an active role in its resurrection as a theatrical film feature, drawing inspiration from the show's rebellious subtext, while Tryon's article shows how the producers of the 2012 science fiction comedy Iron Sky extended the playful nature of their film's content to raise money for the production from potential viewers. Both articles expand nicely on Telotte's first manner of "privileging" the cult film's audience by providing it with special access to the text, showing how, in the age of the internet and crowd-funding, this access is not limited to watching and interpreting the film but also extends into involvement in its very production. 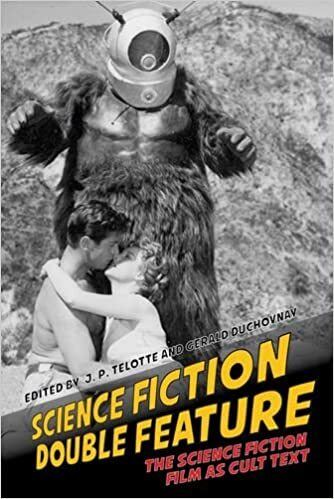 The third and final section of the book, devoted to "The 'Bad' SF Text," examines the different ways in which science fiction cult films challenge common perceptions of good taste—and whether these films truly deserve their poor reputation. It opens with three strong articles: J.P. Telotte's examination of badly-constructed story and design elements common to cheap science fiction cult films, Rodney Hill's analysis of how Ed Wood's early film Glen or Glenda (1953) echoes in his later science fiction films, such as Plan 9 from Outer Space (1957), and Sherryl Vint’s exploration of female monstrous sexuality in films such as Cat-Women of the Moon (1953) and Attack of the 50 Foot Woman (1958). All three articles are strong demonstrations of the second manner of "privileging" the cult film's audience offered by Telotte in the book's introduction—deliberate distancing of the audience from the text. Thus, the manner in which cult science fiction cinema challenges the audience's aesthetic (proper narrative, attractive design) and social perceptions (gender roles and sexual norms) is not all that different from the manner in which avant-garde cinema and art do it (a point made explicit in Hill's article), and it is one of the major attractions of cult science fiction cinema. The book concludes with three articles that return to analyze specific case studies: Rob Latham writes about the fusion of the New Wave of literary science fiction and the science fiction cinema of the '70s with Dark Star (1974) and A Boy and His Dog (1975) as two prime examples; M. Keith Booker examines how capitalism is satirized in Stuart Gordon's Space Truckers (1996); and Jeffery Weinstock presents Bubba Ho-Tep (2002) as an example of "seriously silly" cult film. As in the first section of the book, each analysis is deep and interesting, but somewhat too specific for my taste, ignoring the greater impact of some of its selected texts. Latham, for example, contrasts the New Wave-inspired films he analyzes with the later post-Star Wars (1977) era, but things aren't that clear-cut considering that Star Wars borrowed at least one crew member from Dark Star (Dan O'Bannon), who was also the driving force behind Alien (1979)—a post-Star Wars film which in many ways carried on the tradition of the films that Latham analyzes. Finally, three articles in the book provide interesting readings, but feel redundant as they have very little to do with its overall theme of science fiction cult cinema: Mark Bould's argument that the Coen brothers' film The Man Who Wasn't There (2001) is "Noir SF," Takayuki Tatsumi's article on the connection between District 9 (2009) and the Japanese "Apache" films, and perhaps most noticeably Nicolle Lamerichs's article about European science fiction conventions (which simply doesn't discuss any sort of film—cult, science fiction, or otherwise). So, what is a cult film? Many articles in the book correspond with Telotte's suggested definition, though without directly referring to it or even feeling committed to some kind of canonical definition at all. The stronger articles in the volume are those that come together to form a bigger picture, one that gives the readers a broad idea about cult films from content and production perspectives, though I did not feel an attempt to draw such a picture characterized the book as a whole. Even so, many individual articles make for good reading, and as any good academic book should—open the door for future research. For that reason if no other, this collection comes nevertheless recommended. When he's not working on his PhD researching animation as a text, Raz Greenberg works as a content editor for an Internet company, and spends his time writing reviews, articles, and stories. His articles have appeared in Strange Horizons , Animated Views , RevolutionSF , and Salon Futura ; his fiction has appeared in FutureQuake , Murky Depths , and Ray Gun Revival , and in several Hebrew genre magazines in his home country of Israel. In 2010, a short story by him was nominated for the Geffen Award, given by the Israeli Society for Science Fiction and Fantasy.